Jim Mallinder says he wants New Zealand star Dan Carter to play against Saints on Saturday. Classy fly-half Carter, who helped the Kiwis claim World Cup glory at Twickenham at the end of October, has recently joined Racing 92 and is expected to make his debut against Northampton in the Champions Cup clash this weekend. 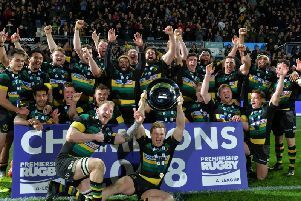 And Mallinder hopes that is the case, with the director of rugby stressing that he wants as much hype surrounding the home side as possible as his team bid to adopt an underdog tag to claim a win in Paris. Saints have won four successive games, with Saturday’s 13-11 win at Bath another example of their ability to boss sides up front. And they will aim to stifle Racing in a similar manner this weekend as they look to stop Carter and Co getting the ball they need to shine at Stade Yves du Manoir. “I think we can look forward to that (the double-header with Racing),” Mallinder said. “We’ve not talked about it much, but we’re in a good position in Europe, we’ve won our first two. “It’s why you play the game, for matches like this, going over to Paris. “Hopefully Dan Carter will play, which will give them lots of hype. When it was put to Mallinder that he might be the first opposition coach to say he wants to face Carter, the Saints boss said: “If I am, then I’ve said something different for a change.